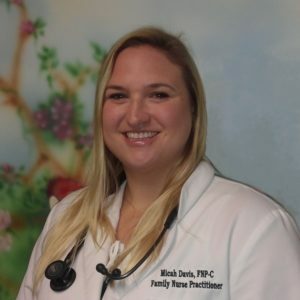 Micah Davis is our Nurse Practitioner here at ABC Pediatrics. She grew up in South Texas then settled here in Central Texas with her family which includes her three children, and husband. Ms. Davis attended Grand Canyon University, where she completed her Bachelors of Science in Nursing and received the President’s award for honors. She continued on to receive her masters, concentrating as a Family nurse practitioner at the University of Texas at Arlington where she graduated with honors and is a distinguished member of Sigma Theta Tau. She received her national certification through the American Academy of Nurse Practitioners and has practiced in Pediatric medicine for a total of 8 years as an RN and a NP before starting here at ABC Pediatrics. Her hobbies include: Watching local Youth Sports. Autism Outreach, Weight Lifting and Crossfit, Traveling by air and car, and spending time with her 3 son's and husband. Life Ambition: Help spread Autism Awareness and Give the best care to all that are in need.